Native Spanish and Basque speaker Irantzu Bustinza Ruiz de Aguirre MCIL CL works primarily as a translator for the surface coatings/chemical industry, and recently qualified for Chartered status. She talks about the impact of languages on her life and career. 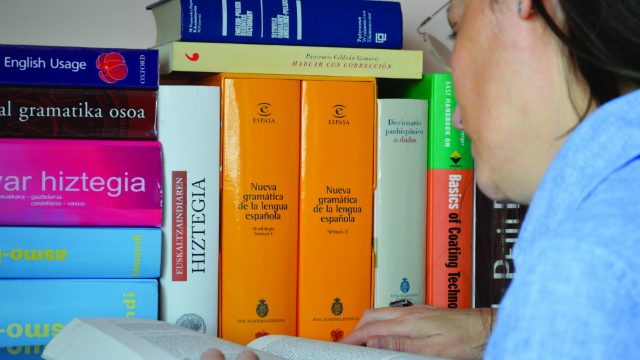 For the original Spanish version see The Linguist 54,3. "Languages have been part of my life from a very early age as I grew up in a bilingual environment where swapping from one language to the other is quite normal. The use of languages just fitted very naturally in my career. I kept learning them because I like communicating, travelling and knowing about other cultures, and I felt I couldn’t achieve that without languages. I originally trained as a lawyer and specialised in international commerce. I had already been doing translations because of my knowledge of English and French. Purely by accident, I started working in surface coatings and it was the best present, as it gave me the opportunity to combine my love of languages and chemistry with my legal and international trading knowledge. As well as translating, today I also provide other services to companies that want to expand their activities in other countries. The challenge is not to translate but to communicate. You might be able to put words and grammar together but that doesn’t mean you are able to communicate. You need to have knowledge of the language but also of the culture. The reward is when you feel you have been able to communicate a message that can be understood. Spending many years in various countries has helped me to grasp all those details that can make the difference. I mainly use English and Spanish, but also Basque and French. The surface coatings industry is quite specialised and you have to be very precise when you talk, as it can be technical. I remember my first technical training: they were talking to me in my native Spanish but I was not able to understand a word. The documents I translate range from fashion to contracts. The variety is enormous. You are doing a job and at the same time you are learning new things every day. I love reading in any languages and try to alternate. At the moment I have four books queuing, each in a different language. I can’t resist having recipe books in different languages. I keep buying magazines on the subject when I travel, and this has also been an excellent way to practise languages. At the moment I am trying to do something about my ‘rusty' Polish with the help of books for children and recipe magazines – and it is working."